Kuten monet kriitikot ovat todenneet, ooppera on erittäin tunteisiinvetoava kuvaus kansalliskirjailijan kiirastulesta. Dramaturgia on kristallinkirkas ja luontevasti etenevä, mikä todistaa sekä Einojuhani Rautavaaran että ohjaaja Pekka Milonoffin osaamisesta, ja solistitkin on moneen kertaan kehuttu loistaviksi. Mikko Franck dirige avec conviction et la scène, simple et dépouillée, met en valeur des chanteurs impeccables autour du baryton Jorma Hynninen - une force de la nature, un roc. Jorma Hynninen (...) ist (...) prägnant im Spiel und trotz seiner fast siebzig Jahre von ungebrochener vokaler Präsenz. Der junge Ville Rusanen setzt ihm als sein jugendliches Alter Ego einen klangschönen, schlanken lyrischen Bariton entgegen. (...) Mikko Franck arbeitet mit einem pulsierenden Dirigat der Szene wirkungsvoll zu. This DVD Video features the three-act opera Aleksis Kivi (1996) by Finnish composer Einojuhani Rautavaara. This release pays tribute to lead role performer Jorma Hynninen on the occasion of his 70th anniversary in 2011. 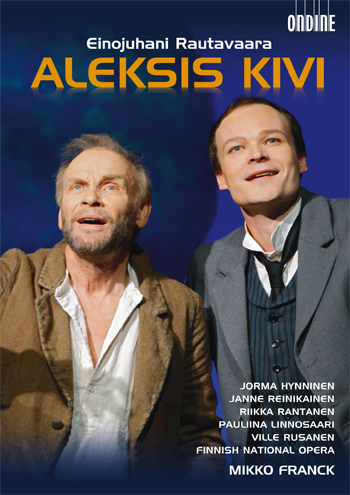 Written by the composer, the libretto tells the story of Finland's national author Aleksis Kivi (1834-1872) and draws on many of Kivi's own poems and texts. Aleksis Kivi wrote the first significant novel in the Finnish language (Seitsemän veljestä / "Seven Brothers"), but during his short lifetime he suffered from moral and artistic condemnation by literary rivals. He died, insane and impoverished, at age 38. Rautavaara composed this opera from 1995-1996 for the Savonlinna Opera Festival. The commission was instigated by Jorma Hynninen, who had been instrumental in the genesis of Thomas and Vincent too. He also created the title roles in all three operas. Aleksis Kivi was premiered in the rock cavern concert hall at Retretti Art Centre near Savonlinna on the occasion of the 125th anniversary of the death of Aleksis Kivi in 1997. The premiere recording followed five years later, in April 2002 (ODE 1000-2D). Several individual numbers from this opera have since then been performed and recorded separately to much acclaim (ODE 1085-2). This recording was made in October 2010 by the Finnish Broadcasting Company YLE and directed for video by Hannu Kamppila, with Timo Anttila as Director of Photography. A co-production of the Finnish National Opera and Ondine, this is the first commercial audio-video release of this opera on DVD. This DVD includes, as a bonus addition, a making-of film featuring composer Einojuhani Rautavaara, lead role performer Jorma Hynninen, and conductor Mikko Franck in interviews.